About Down Syndrome – Broward Gold Coast Down Syndrome Org. Down syndrome is usually identified at birth or shortly thereafter. Initially the diagnosis is based on physical characteristics that are commonly seen in babies with Down syndrome. These include low muscle tone, a single crease across the palm of the hand, a slightly flattened facial profile and an upward slant to the eyes. 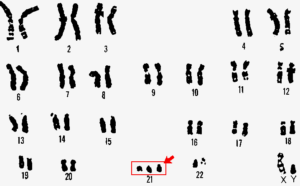 The diagnosis must be confirmed by a chromosome study (karyotype). A karyotype provides a visual display of the chromosomes grouped by their size, number and shape. Chromosomes may be studied by examining blood or tissue cells. Trisomy 21 (nondisjunction) is caused by a faulty cell division that results in the baby having three #21 chromosomes instead of two. Prior to or at conception, a pair of #21 chromosomes in either the egg or the sperm fails to separate properly. The extra chromosome is replicated in every cell of the body. Ninety-five percent of all people with Down syndrome have Trisomy 21. Translocation accounts for only 3% to 4% of all cases. In translocation a part of chromosome #21 breaks off during cell division and attaches to another chromosome. The presence of an extra piece of the 21st chromosome causes the characteristics of Down syndrome. Unlike Trisomy 21, which is the result of random error in the early cell division, translocation may indicate that one of the parents is carrying chromosomal material that is arranged in an unusual manner. Genetic counseling can be sought to ascertain more information when these circumstances occur. Mosaicism occurs when nondisjunction of chromosome #21 takes place in one of the initial cell divisions after fertilization. When this happens, there is a mixture of two types of cells, some containing 46 chromosomes and some 47. The cells with 47 chromosomes contain an extra 21st chromosome. Because of the “mosaic” pattern of the cells, the term mosaicism is used. This type of Down syndrome occurs in only one to two percent of all cases of Down syndrome. Regardless of the type of Down syndrome a person may have, a critical portion of the 21st chromosome is present in some or all of their cells. This additional genetic material alters the course of development and causes the characteristics associated with the syndrome.